Below is the rush transcript of "This Week" on June 15, 2014. It may contain errors. ANNOUNCER: Starting right now on ABC's This Week. Breaking news -- crisis in Iraq. Extremist fighters now minutes from the capital. Will we be drawn back into war? Plus, the surprising threat to the U.S. This Morning, Martha Raddatz on the ground in Baghdad. REP. ERIC CANTOR, (R) VIRGINIA: We came up short. ANNOUNCER: Voters venting their anger. One of Washington's most powerful leaders got ousted. This morning, Eric Cantor here live. UNIDENTIFIED FEMALE: They're not going to survive. ANNOUNCER: Children flooding into the U.S. without their parents. What can be done to prevent catastrophe? MARTHA RADDATZ, HOST: Good morning. I'm Martha Raddatz coming to you from Baghdad where we're tracking breaking news in a fast moving crisis that could draw the U.S. back into war. President Obama now considering air strikes as an army of jihadists remains just 60 miles north of this capital. And while there will be no American boots on the ground, just last night the air craft carrier USS George H.W. Bush and two other warships were moved to the Persian Gulf. We have team coverage of every angle, including the possible homeland security threat. But we begin here in Baghdad where we arrived this morning to find a city bracing for attack, ready to take up arms, the country where nearly 4,500 Americans gave their lives now on the brink of civil war. RADDATZ: Security forces here mobilizing, residents here hoarding food and supplies fearing the extremist jihadi group beyond the city's borders will strike. The country's political and religious leaders now calling for new recruits to take up arms. This morning, we met some of the young men eager to join the fight. Are you ready to take up arms? UNIDENTIFIED MALE: Definitely. The situation depends on defending my city, I will definitely defend it. RADDATZ: New recruits, mostly majority Shias from the south of the country, pushing back against the extremist Sunni jihadi group threatening to pull Iraq into a sectarian civil war, exactly the nightmare scenario the U.S. ambassador to Iraq told us he was deeply concerned about when we were in Baghdad earlier this year. ROBERT BEECROFT, U.S. AMBASSADOR TO IRAQ: The violence has a grinding effect that can inflame these tensions that are there and particularly sectarian ones and that risks a larger conflict. RADDATZ: Emerging from the chaos next door in Syria the extremists call themselves ISIS for the Islamic State of Iraq and Syria where this group hopes to build the new state under strict Islamic rule, their tactics so brutal that even al Qaeda has disavowed them. And as their fighters under black flags have marched south through Iraq, the city's have fallen one by one from Mosul in the north to Saddam Hussein's hometown of Tikrit where ISIS claimed Friday they executed some 1,700 captured Iraqi forces more than 200 miles in a matter of days. Their march causing an exodus of refugees throughout the country. I've traveled to Iraq more than 20 times in the past decade of war, watching as the U.S. made standing up Iraqi security forces its primary mission. Back in 2005, a confident General David Petraeus explained the goal for training Iraq's military. GEN. DAVID PETRAEUS, U.S. ARMY: We have to make sure is that everyone feels that they're going to back up the other element. And I think that you saw that here today. RADDATZ: But those forces have largely failed, abandoning their uniforms and billions of dollars of U.S. provided weapons and equipment now in the hands of the enemy. The U.S. is now weighing how to respond to the deteriorating situation. President Obama moving warships into the Persian Gulf, including a carrier armed with missiles and packed with fighter jets. But on Friday, President Obama ruled out American forces returning to the country. BARACK OBAMA, PRESIDENT OF THE UNITED STATES: We will not be sending U.S. troops back into combat in Iraq. Ultimately it's up to the Iraqis as a sovereign nation to solve their problems. RADDATZ: And with more on what those U.S. options might be, we return to Washington and my colleague Jonathan Karl -- Jon. I am told that President Obama personally approved the movement of that aircraft carrier the USS George H.W. Bush into the Persian Gulf as all of the pieces are now being put in place to carry out air strikes if the president decides to give that order. But remember, he said there will be no U.S. military action until the Iraqi government first takes steps to resolve its political crisis. As one senior White House official tells me this weekend, there is no indication that that is happening. But what options will the president consider? Let's bring in our expert Steve Ganyard, former marine fighter pilot, who has actually flown combat missions over Iraq. So, Steve, tell me what are the options that are being presented to the president right now? KARL: So, piloted aircraft dropping bombs. Now we do have unpiloted aircraft, the drones, the predator and reaper drones that are up in Incirlik up in Turkey. And we have ships out at sea. So there's very -- there's quite a bit of firepower in the region, but the real question is what do we apply that firepower to? KARL: Yeah, so that's the biggest -- what do you target? And, you know, this is not a traditional military operation, these are guys operating out of pickup trucks in many cases. So how do you go after an enemy like that? You have no headquarters to bomb, what do you go after? GANYARD: That's the difficulty, picking out targets. Who is going to do that for us? If the president doesn't allow us to put anybody -- any boots on the ground, we will have surveillance assets, we'll have television cameras and drones overhead that will be able to look. But what are they looking at? They're looking at guys in trucks, some may have black flags, but they look just like the civilian population. So there's real danger here in picking out targets. KARL: And for even with drones, usually you have somebody on the ground actually pointing out a target. GANYARD: You do. And so who is going to approve those targets? And what happens if we hit a school? What happens if we hit something that the Iraqis want us to hit, but may not be in the best interests of the United States? We have the Iranians on the ground now, are we going to be picking out targets for the Iranians? KARL: Now you saw General Allen said that we should do a hard blow against ISIS. Can you do that without ground forces? GANYARD: It's hard to figure out who do we make that hard blow against? Again, this is almost a Sunni insurgency, it's more of a popular uprising. When we saw ISIS come down out of Syria, they came through areas that were sympathetic to their cause. So this is really more of an Iraqi-Sunni blowback against the Maliki government rather than some determined enemy coming out of Syria. KARL: And just quickly, do you think the president will be looking at possibly hitting targets inside of Syria as well, given that, as you point out, this is where ISIS comes from? GANYARD: The president has been having to play a game in Syria and a chess game in Iraq. I don't think that he's going to want to conflate the two. I think that he'll probably try to keep everything that we do within Iraq and continue to stay out of the Syrian conflict. KARL: All right, Steve Ganyard, thank you very much. And for more on what's going on with the Iraqi army, let's check back in with Martha Raddatz in Baghdad -- Martha. Joining us now is General Peter Chiarelli, an ABC contributor who spent two years on the ground in Iraq. I was with him during much of that deployment, some of it the worst fighting of the war. Thanks for joining us, General Chiarelli. I want to ask you first whether you believe the jihadists will move into Baghdad. GEN. PETER CHIARELLI, (RET.) ABC NEWS CONTRIBUTOR: Well, Martha I don't think they will. I think things get a lot tougher the further south you go. And I think that's why you haven't seen any initial movement right now. It's always a possibility, but it will definitely get tougher if they try to move into Baghdad. RADDATZ: A lot of people I've talked to here seem to think it's a possibility they could be regrouping. But even if they don't, what has to happen in the rest of the country? Can they ever get back Mosul? Can they ever get back Fallujah? What do you see the future of this country? CHIARELLI: Well, I don't see it without some kind of inclusion of the Sunnis into the government. I really believe that that's the problem. We're seeing almost eight years of a deliberate effort to exclude them from the government. And that's why conditions have been right for ISIS to move into the areas that they've moved into, because they've gotten the support of the Sunnis. RADDATZ: I used to walk along Abu Nuwas. I just did it again. We just drove past Abu Nuwas street. I walked there with you once and you had such a vision for this place. I think I remember saying you were the general with rose-colored glasses. What really happened here? CHIARELLI: Well, you know what, Abu Nuwas was a symbol. It was a symbol of the Iraqis that many of us who met who wanted to work together. And it was a place in Baghdad where they had gone. And they had lived together. They coexisted together. But that all seems to have unraveled. And it's been unraveling for the last eight years. RADDATZ: But what about the Iraqi security forces? Billions and billions of dollars on those Iraqi security forces. They take off their uniforms and run? CHIARELLI: Martha, there's no doubt that we trained a very good force. The question we should all be asking ourselves is why did they drop down their weapons and run? And I would argue, it is because that those forces in the north probably with Sunnis -- Sunni dominated, felt that they would not get the support of their government. That's the critical question here. There's no doubt they have the equipment. There's no doubt they have the training. The problem is, they have no trust in their government. RADDATZ: Can I ask you just quickly, General Chiarelli, do you think Americans should be concerned about this? CHIARELLI: I -- I definitely do. This is an organization, ISIS, that's taken -- they've taken -- they have an opportunity here. They've taken advantage of that opportunity. And I think we should really, really be concerned. I read some place yesterday where they're the richest terrorist group in the world after what they were able to seize in Mosul. So I -- I am concerned and I think all Americans should be concerned. RADDATZ: Thanks so much, General Chiarelli. We're going to go back to Jon Karl in Washington to talk more about the threat to the homeland -- Jon. Federal law enforcement officials are deeply concerned about that threat, issuing some stark warnings. ABC's senior justice correspondent, Pierre Thomas, has the latest. PIERRE THOMAS, ABC NEWS CORRESPONDENT (voice-over): Islamic radicals -- some more ruthless than al Qaeda, overrunning cities in Iraq. Al Qaeda fighters just across the border in Syria, training, learning, killing -- two conflicts joined by extremists from around the world. Some of them, like this young man, are Americans. Al Qaeda claims they turned them into a suicide truck bomber who did this in Syria. THOMAS: Top U.S. officials fear what's happening thousands of miles away could become a clear and present danger for the homeland here. The next 9/11 is in the making. THOMAS: In recent exclusive ABC News interviews, FBI Director James Comey and Homeland Security Secretary Jeh Johnson issued stark warnings. JEH JOHNSON, DIRECTOR, DEPARTMENT OF HOMELAND SECURITY: Syria has become a matter of homeland security. THOMAS: At least 70 Americans are believed to have joined the thousands of foreign fighters in Syria. JOHNSON: With my European counterparts, we've been working together on sharing information, tracking these individuals. THOMAS: Sources tell ABC News some of those potential terrorists have already made their way back to the US. (on camera): Can you give us a sense of how active you are at making sure that you're keeping an eye on those people? JOHNSON: Very active. The civil war there is offering an opportunity for thousands of foreign fighters to get training in the worst arts of terrorism. THOMAS (voice-over): And just this week, the FBI director was equally blunt, appearing before Congress. JAMES COMEY, DIRECTOR, FEDERAL BUREAU OF INVESTIGATION: We are determined not to allow a line from today's Syria to be drawn to future 9/11s. THOMAS: But radicals are following back and forth over a porous border between Syria and Iraq and they've done more than take over cities in Iraq. They've captured military equipment and millions in cash. UNIDENTIFIED MALE: Al Qaeda now has hundreds, perhaps millions of dollars they didn't have before which they can use to buy equipment and move people around. THOMAS: Including possibly to the U.S. homeland. KARL: With us now, Congressman Michael McCaul, the chairman of the Homeland Security Committee. And Martha is back with us from Baghdad. Mr. Chairman, let me start with you. You issued a statement saying the president should take immediate action in Iraq. REP. MICHAEL MCCAUL (R-TX), CHAIRMAN, HOMELAND SECURITY COMMITTEE: Well, this is a crisis. It does call for a response, not going to Palm Springs for a fundraiser. I talked to Ambassador Crocker yesterday and he said that this is the greatest threat, national security threat, since 9/11. Al Qaeda owns more territory, more resources. And what's happening in -- in Iraq right now is a -- really chaotic. I think what needs to be done, if the White House called me and asked me for my advice, I would call the top team of commanders and diplomats who won this war and I would get their advice as to what to do moving forward. MCCAUL: -- which has put us in this situation that we're in today. KARL: But -- but I'm asking, the immediate action, you're not just calling for him to get advice. I mean do you think that he should take military action right now? KARL: Should there be air strikes? MCCAUL: I think he needs to look at his options. But I'll tell you, in talking to the ambassador, who knows this situation better than anybody, he believes that a diplomatic political solution between the Sunni, Shia and Kurds needs to take place now. Hagel and Kerry need to be in the region, getting a regional strategy together, with our allies, to deal with this situation, because, you know, look, it -- without their cooperation against the extremists, this is not going to happen. They're not going to do it on their own. They need us to lead them and we're not leading right now as a nation. KARL: Now, when the president addressed this issue on Friday, he twice used the word "eventually" when talking about the threat that this group would pose to U.S. interests. How far down the line until these people we've seen marching in Bagh -- you know, toward Baghdad, pose a threat to the United States? MCCAUL: This al Qaeda faction, ISIS in Syria and now in Iraq, is so extreme, that Zawahiri and Core Al Qaeda have denounced them. That's how dangerous they are. This is not some down the road prospect. I would argue that not only is the threat great in Iraq and Syria, but so to the homeland, because we have a lot of individuals over there with legal travel documents that are trained -- and these are the vicious, the worst of the worst. If they get back into the United States or in Western Europe against Western targets, I see that as a biggest threat today. KARL: So let me turn to Martha then -- Martha, you're there on the ground. We see that black flag of al Qaeda flying over Iraqi cities. What is your sense on this group's vision and how much does attacking American interests, American targets, fit into their plans? RADDATZ: I think there's no question this is a group that is anti-American and if they could attack America today, they probably would. I don't think they're ready for that. But look at the equipment they're getting. Look at the other people who are joining them in the fight. It is total chaos over here right now. I -- I cannot stress that enough. Here in Baghdad, people are truly afraid. They think they're going to be attacked. And when you look at the Western interests around here, there are a lot of Americans here, there are a lot of Westerners here. And you can be sure they would try to target them. KARL: -- this could be a much more well-funded, well-equipped al Qaeda than we have seen. MCCAUL: Of course. And they -- they have half a billion dollars now in new cash infused. They -- they have our weapons now. It's a highly good recruiting mechanism for them. What we really have, Jon, is a vacuum. And the vacuum is being filled by this extreme Al Qaeda faction. But also what concerns me is that Iran is moving in, as well. So we have the Shia brethren concept, but don't think for a minute that Iran is not looking at this vacuum as a potential power grab, as well. And I think we need to be very cognizant of that fact. KARL: Well, does it give you any unease that if the United States acts militarily here, we will be acting, in a sense, on the side of the Iranians? I mean the Iranians have also -- reports are moving in to fight this faction on behalf of the Iraqi government. MCCAUL: Right. And that's why we have to be very careful with any military strategy. I think diplomatically, we've got to bring this -- the Sunni-Shia-Kurds together against the extremists. Mal -- Maliki has failed, as well as our president without the status of forces agreement. He failed to engage in the Sunni tribal leaders to stop this. And now the blowback is happening. But we need to stop this. But the action needs to be now, not two weeks down the road. The president should come back to the White House, get a team of experts together. KARL: Just very quickly, you heard Lindsey Graham say we may be seeing another 9/11 in the making. MCCAUL: I -- I believe it's one of the biggest threats that we see. When you look at the terrorist training ground operations in Syria and Iraq, I believe it is one of the biggest threats. And if I could just stay with this. I talked to a Gold Star Mother in my district and it's resonant of many of those out there, just saying that, you know, my son died in Fallujah. He believed in what he was doing. And I just want it to count for something. And what I'm seeing today makes me sick, that it -- I don't want to have to question that. KARL: All right, Mr. Chairman, thank you. We'll be back with more from Martha in Baghdad later. But coming up, the political earthquake that rocked Washington. Republican Leader Eric Cantor's stunning loss -- how did it happen and what's next? Eric Cantor is here and he's standing by live. KARL: Now our closer look at a political shocker, a rising Republican star stunning primary loss to a longshot Tea Party candidate. Eric Cantor is here for his first network interview since the votes were counted. But before we get to that, ABC's Jeff Zeleny on all the fallout. UNIDENTIFIED FEMALE: It's not a joke at all, it looks like he has pulled off the upset of the political year. JEFF ZELENY, ABC NEWS CORRESPONDENT: It stunned just about everyone, including the man in the middle of it all. CANTOR: I know there's a lot of long faces here tonight, and it's disappointing, sure. ZELENY: So how did Eric Cantor, who was at the table for nearly every big moment in Washington lose his primary? Perhaps it's a mix of three reasons. First, did he lose touch with his district? That's what these voters said. UNIDENTIFIED FEMALE: He's up there. He's a Washington boy. He wasn't for our district. UNIDENTIFIED MALE: I haven't seen Cantor anyplace. He just -- he's too -- he's too good to come around and see everybody. ZELENY: Or did he get caught off guard by a fresh face riding a Tea Party talk radio wave. Dave Brat is an economics professor whose anti-Washington message caught fire. Overnight, he became a Republican giant slayer with a shoestring operation compared to Cantor's gold plated campaign. While Cantor once spent $18,000 for lodging and catering at the Beverly Hills hotel. Brat's largest similar expense was a $789 check to Honey Baked Ham. When we met Brat last month, he pulled up outside the Capitol in his Chevy. DAVE BRAT, REPUBLICAN SENATE CANDIDATE: I tell the truth. And I will be the voice of the people. And I will be accessible. ZELENY: Or was Cantor's shocking loss really about immigration? Cantor said it was time to find common ground. But Brat took a hard line. ANNOUNCER: Stop amnesty by stopping Eric Cantor on election day. ZELENY: Cantor's defeat makes Republicans even more skittish about embracing immigration reform. In terms of dealing with issues like immigration, Eric Cantor can be branded -- you know that he is supporting amnesty. How can your party ever move forward on an issue like this? REP. JOHN BOEHNER, (R) OHIO: We don't know that that is the issue, or was the issue in the election. ZELENY: Republicans will choose a new majority leader this week. Another chapter in the Tea Party Clash with the GOP establishment that raises new questions about whether there's room for compromise under that big Republican tent. CANTOR: I think that this town should be about trying to strike common ground. ZELENY: For this week, Jeff Zeleny, ABC News Capitol Hill. KARL: Right. And Eric Cantor joins us right now. So, let me ask you, your friend Vin Weber said said this was an earthquake that nobody thought you would lose. And watching you on election night, you certainly looked stunned. Did this completely shock you? KARL: Your pollster John McLaughlin had you up 34 points. You paid him, what, $75,000. Are you expecting a refund? What happened there? CANTOR: Listen, I know there's going to be a lot of people and a lot of polls being done to sort of dissect what happened. And you know, frankly, that's really not what I am focused on now. And in fact, I want to take what I have been doing here and the experience and privilege I have had of representing the people of the 7th District of Virginia and be able to really look towards the future so I can really continue to promote and be a champion for the conservative cause. KARL: Well, I want to get to what you're going to do, but you said the day after the election that you did everything you could. You really believe that? You lost by double digits. CANTOR: We ran a campaign premised on conservative solutions that help working middle-class families in the 7th District of Virginia. It's very much the same that we're trying to do here in Washington. You know, people are hurting right now. You know, you're saying that I certainly have had a personal setback, but that problem pales in comparison to the problems that working-class Americans are having every day, some are out of a job. Some can't make ends meet. We've got to be focused on how we, as conservatives, can help people that are suffering under this economy, under Obama's policies. KARL: This was a staggering turn of events for you. You know, you had been considered the next speaker of the house. You saw that in the headlines, Eric Cantor the next speaker? Had you done anything, had to talked to anybody, to prepare for a possible run against John Boehner for speaker? CANTOR: You know, Jonathan, I have been really privileged to be the representative of the 7th District of Virginia for almost 14 years. I was also given the privilege of serving as majority leader by my colleagues. My focus of my team, myself, every day was to shape an agenda to continue to put ideas out there that reflect our common sense conservative solutions. We're going to have a moment in this country where we need actually to solve problems and stop the kind of lurch leftward that we're seeing. And so I believe we're getting ready for that. And as I go forward, I will continue to find ways that I can be influential in making sure we continue that drive for solutions. KARL: So, there's been a lot of discussion as to what happened, why you lost. One of your colleagues, Republican colleagues in the house, Steve King, had this to say, in a tweet, election night, "earthshaking primary results in Virginia tonight. Resounding rejection of amnesty and support for rule of law. Personal regrets to Eric." So is that what this was? Was this is an earthshaking result, rejection of amnesty, of immigration reform? CANTOR: First of all, I don't think there's any one particular reason why the outcome was what it was. And there -- if you think about it, there are a number of things that go through voters' minds when they go into the voting booth. But as far as immigration is concerned, my position never wavered. I have always taken the position that I'm not for a comprehensive amnesty bill. I have always said that we ought to deal with the kids who did not break any laws of their themselves, came into this country, in many cases, unbeknownst to them. I have always said that. And it's a principle positioned. And it's one thing that offers the only plausible way forward. Now, did that infuriate folks on both sides? Sure. But it is the principled position. I think an incremental reform approach to immigration is what we need. We have got to focus on the things we agree on, not that which we don't. I have told the president this, my colleagues are well aware of it and I think my constituents were. KARL: Laura Ingraham went after you and in some deeply personal ways. I want to play some of her gloating after the election. Here's what she had to say. LAURA INGRAHAM, CONSERVATIVE TALK SHOW HOST: He wasn't coming clean on what his real views on immigration were. And I think people understood that in the end. UNIDENTIFIED MALE: Well, you know, Laura. INGRAHAM: He came across as a phony. I mean, I'm sorry, but he came across very two-faced on that issue. KARL: So, I mean, she even suggested that you should be traded to the Taliban, somewhat of a joke. Did she cross the line? Do you blame her for the loss here? CANTOR: Listen, I'm not into blaming anyone. But I will say that the suggestion that I should have been traded to the Taliban for Sergeant Bergdahl really is not a serious contribution to any public policy debate, and frankly, I don't think that it reflects on the people that self-identify as Tea Partyers. I think they reject that kind of notion. And it's just not serious. And frankly it cheapens the debate. KARL: Well, what do you say to those Tea Party -- those groups claiming they represent the Tea Party, going after you, going after other Republican leaders? What contribution are those groups making? CANTOR: Listen, there's a lot of frustration out there. I have seen it. There's frustration against this president. There's a frustration against Washington, of not being able to stop this president when he says I've got a phone and a pen and I'm going to do what I want if you Republicans don't agree with him. There is frustration. And one of the things that, you know, I want to remember, is Tea Party means taxed enough already. You know, these are moms and dads, grandmothers and grandfathers that got into the political debate and process back in 2009 after the lurch leftward, expansion of government with Obamacare, Dodd-Frank, cap and trade, stimulus and the rest. KARL: So was your defeat a -- a victory for the Tea Party, as people have portrayed it? CANTOR: Listen, I think that what we need to focus on -- and I'm hopeful that I'll be able to do something about bridging this divide. There is a divide within our party. And, again, I hope that it is the way toward divi -- bridging that divide is through solutions. You know, we've got to demonstrate the conservative ideas through limited government, personal responsibility, creating more space in the private sector is the answer to so many working middle class people's problems right now. KARL: OK, so what is next for you? Do you see yourself ever running for office again? CANTOR: You know, Jonathan, I'm going to be talking to my wife a lot. CANTOR: And it's a -- you know, we have had a wonderful relationship. We've been married for almost 25 years. And she and I are going to make some decisions together about how we go forward. I don't want to close off any options right now. I'm just hopeful that I can continue to be a champion for the kinds of things that we are working on here in Washington. I believe after almost 23 years in public service, 23 plus years in public service, that -- that I can play a role and not just in elected office, obviously, but in the private sector. KARL: Would you rule out becoming a lobbyist? CANTOR: I don't -- I -- I don't think that I want to be a lobbyist, but I do want to be -- play a role in -- in the public debate. I've had a lot of experience, obviously, in the intersection of government and politics and issues affecting the global economy. So, again, I've been very gratified by the number of people that have reached out to me already. CANTOR: -- and that my wife and I will make as I continue to want to serve out my term. KARL: All right, Eric Cantor, thank you very much for joining us. KARL: Back now with snapshots of a humanitarian crisis in the making -- thousands of children are in limbo in American detention centers after crossing into the U.S. illegally without their parents. ABC's Jim Avila with more on this new flashpoint along the border. JIM AVILA, ABC NEWS CORRESPONDENT (voice-over): A flood of immigrant children surging across the Mexico-Texas border, often alone. These pictures obtained by ABC News show teens and younger children packed into fenced cages and on hard floors. And this video obtained by "The Washington Post" shows similar harsh conditions -- children detained by the U.S. Border Patrol, so unequipped, individual agents are using personal resources to care for them. UNIDENTIFIED MALE: They are doing everything from mixing formula to bringing in their own children's clothing. AVILA: In 2011, 6,560 unaccompanied minors were detained crossing illegally. But by the end of this year, an esteemed 60,000 will have made the dangerous, often deadly, trip. This week, Baylor University Dr. Lori Baker led a forensic team tracking immigrant border deaths, finding more and more unmarked child graves. PROF. DR. LORI BAKER, BAYLOR UNIVERSITY: We're seeing so many crossings. They can't regulate heat. They're not going to survive that. AVILA: Why are they coming now? Most are fleeing an increasingly violent Central America. BARACK OBAMA, PRESIDENT OF THE UNITED STATES: This is not amnesty. AVILA: But Republicans charge the Obama administration's new immigration policy, known as the Dream Act, which defers deportation for some children, is to blame. UNIDENTIFIED MALE: Its policies have created a human magnet for these children to come at great risk to themselves. AVILA: The White House forced to send a message this week, directed at parents in Central America, that the Dream Act does not help their kids. JAY CARNEY, WHITE HOUSE PRESS SECRETARY: Putting your child in the hands of a criminal smuggling organization is not safe. AVILA: A message so far largely unheard. KARL: We'll get to immigration shortly, but first our roundtable. We have Bill Kristol, editor of "The Weekly Standard," Democratic strategist Donna Brazile, talk radio host Laura Ingraham and Illinois Congressman Luis Gutierrez. Bill, I want to start with you. You called Cantor's loss a verdict against the Republican leadership in Washington. But in virtually every other primary leading up to this, Republican leadership figures won. Wasn't this a matter of Cantor losing touch with his district? KRISTOL: -- occasionally -- $168,000 entertaining lobbyists and donors at these two -- two steakhouses, more than David Brat spent on his entire campaign. KRISTOL: -- by over 10 percent. Something was going on there. Cantor was out of touch with his district. Immigration was a big issue, but above all, Republican voters are unhappy with Republican leaders. KARL: -- in -- in large measure, why this happened. You obviously went down there and you campaigned for his opponent. You used your talk radio show to attack Cantor. I want to have you listen to what Cantor just told me about one of your attacks on him. CANTOR: The suggestion that I should have been traded to the Taliban for Sergeant Bergdahl really is not a serious contribution to any public policy debate. And, frankly, I don't think that it reflects on the people who self-identify as Tea Partiers. I think they reject that kind of notion. And it's just not serious, and it frankly -- it cheapens the debate. LAURA INGRAHAM, TALK RADIO SHOW HOST: Well, you know, Eric Cantor, I believe, wouldn't show up at the first Tea Party convention in his own state, which first set him on the wrong path with the Tea Party. I helped give a little bit of a platform to David Brat. But this was a -- a win for grassroots activists on the ground in Virginia, some Tea Party groups locally. National Tea Party groups didn't really do much in this race, didn't really help at all until the very end, a little training that went on. but this was an understanding on the part of the voters -- and I have a little flier. This -- this -- I don't know if the camera can get this. This is what was being circulated in the last several days of the campaign. This is a picture of Eric Cantor with Mark Zuckerberg of Facebook. We've got 20 million people out of work. We -- they want 20 million new foreign workers in the United States. This was a campaign where the voters understood that if Eric Cantor went back to Washington, that was a green light for immigration reform. They call it that. The voters called it amnesty. KARL: It's so -- it's so odd though. I mean Cantor also had his own flower -- flier saying he was against amnesty, he was standing against amnesty. INGRAHAM: Well, he had $5 million to send that one out, didn't he, donna? KARL: -- you know, Wednesday after the election. He said what is Eric Cantor's position on immigration reform? INGRAHAM: Well, actually, that's totally wrong and the interview kind of -- it was just stunning to watch that interview. He hasn't learned anything. Eric Cantor wrote -- he was the co-author of the House GOP principles on immigration reform. Both "The New York Times" and "The Washington Post" said that that captured the essence of what was in the Senate immigration bill. KARL: Well, let's ask him. KARL: Congressman Gutierrez, you have been certainly leading the charge for immigration reform. Was Eric Cantor on your side? REP. LUIS GUTIERREZ (D), ILLINOIS: I have never had a conversation with Eric Cantor about immigration. I've never had one conversation. We were at a religious site, a synagogue in Queens together to talk about the plight of Jews in this country and his own personal experience as a Jew. That is the one time. And I think that it is regrettable. Look, I'll tell you something, if you allow your opponent to say that immigration reform is amnesty, you're going to lose. DONNA BRAZILE, DEMOCRATIC STRATEGIST: Right. GUTIERREZ: I am not for amnesty. I am for replacing the illegal immigration system with a legal immigration system. Let me just suggest that that night, those that want amnesty won that night, because they have taken away from the table securing our borders, making sure we have a verification system in this country when somebody gets employed. And when we're watching what's happening in Iraq today, we need an even better system that has checks and balances about who's coming in and who's going out. KARL: So, why can't we secure our borders? KRISTOL: Why can't we secure our borders? Have people voted against Eric Cantor have taken that off the table. INGRAHAM: So, we can't enforce our laws right now? GUTIERREZ: That's not what I'm saying. INGRAHAM: Yes, you are saying that. We can't enforce our laws. But Luis, did you not praise Eric Cantor's principles on immigration that were in the House of Representatives? Did you not praise those principles? GUTIERREZ: Here's what I said. Here's I said. I said as a Democrat, we need to respect the fact that there's a Republican majority in the House of Representatives and when they put forward those principles, principles by the Republican leadership, I said, I want to sit down. KARL: Donna, jump in here. BRAZILE: First of all, I was ready to stand in between Eric Cantor and Laura Ingraham. INGRAHAM: All right, he can't a joke about the prisoner swap. He has no sense of humor, that's why he lost. BRAZILE: He should have been Krispy Kreme down in his district. He was out of touch. And the Tea Party is still highly caffeinated. Because the Tea Party is the energy inside the Republican Party. You ignore them, you ignore the base and that's a problem. And he ignored the base. KARL: I have got also ask you, you ran a national presidential campaign. BRAZILE: And we lost Tennessee, hello. KARL: OK. I know, but, look at this, he ran ads -- Cantor ran ads attacking Dave Brat by name. This is somebody nobody had heard of. I mean, isn't it like malpractice? BRAZILE: He raised his profile. And you know this was a classic David versus Goliath. What Mr. Brat had, Professor Brat, he had energy, he had a message and that resonated with voters. KRISTOL: Also, Eric Cantor ran adds, his political consultants told him, this will be clever. Brat, is running to your right on immigration and other issues as a true conservative and you're part of the squish Republican leadership -- so attack Brat as a liberal. Why? Because Caine, a Democrat, put him on some advisory board on economic development. Pretend you're to the right of Brat on immigration. That's what about a million dollars of the ads were. I think is showed a certain contempt for the voters and it backfired. INGRAHAM: And Jon, Lindsey Graham -- Lindsey -- he made grand point, this has to be corrected. There were six opponents of Lindsey Graham in that primary, not one of them ran on the issue of immigration. None of them ran the Dave Brat campaign. INGRAHAM: Jonathan, you have to understand this, it was focused on the working class. None of them ran on that issue. UNIDENTIFIED MALE: One of the major challenges to Lindsey Graham was immigration. INGRAHAM: Not in his six opponents. GUTIERREZ: If I could finish. I know you are used to your radio talk show where you get to talk all the time, let me get a chance -- and it's also ABC. KARL: He didn't hide his position on immigration. GUTIERREZ: Because he said he was for replacing our illegal immigration system. If I could just finish up. And what is essential to it is I did have conversations with Lindsey Graham. I did support the Senate version of immigration reform. And he defended it before his voters and his voters resoundingly reelected him. KARL: I want to ask what you accomplish here, though, you and those who pushed Cantor out? You now have arguably a more liberal -- or more moderate majority leader coming in, in Kevin McCarthy, and Brat has been elected -- this is a PhD in economics who can't tell us his position on minimum wage. INGRAHAM: Well, what we know now is that the issue of immigration is a critical issue in American politics. I'm not running the GOP. This is -- let me tell you something, Jonathan, if the results last week were that Eric Cantor won by 11 points, you would be doing "This Week," saying greenlight to immigration reform. This race shows you the Tea Party is dead, talk radio is dead, immigration reform is dead. You wouldn't be picking out jokes at a rally and saying this got really personal. It would be Eric Cantor is going to be working with people like Luis Gutierrez to find common ground on immigration. KARL: We have to take a quick break. We don't have time for our powerhouse puzzler, but we'll be back with more of our powerhouse roundtable. KARL: All right, more with our roundtable now. Why don't we turn to Iraq. The president says he's considering possible air strikes against this al Qaeda affiliated group in Iraq. Donna, he says he's reviewing his options. Is the president moving too slow on this? I mean, John Boehner said he was asleep. BRAZILE: Well, how can you move slow on this crisis? This is a setback, no question about it. After trillions of dollars that we spent training the Iraqi army, trying to stabilize the country. There's no question this is a setback. But the problem is, we have -- we have an ally, or so-called ally, Mr. Maliki, who's not doing his job as president. He's alienated the Sunni minority population. He's given Iran a foothold into coming into Iraq. This is a disaster in the making. But, ISIS, they're picking up support from the Sunni minorities population who feel like they have been alienated, they've been abandoned. And that's why they've taken up arms with this jihadist group. KRISTOL: It is a disaster. Donna's right. It's a disaster unfortunately made possible, or certainly made more likely, by our ridiculous and total withdrawal from Iraq in 2011. President Obama said two days before election day, in 2012, al Qaeda is on the path to defeat, the war in Iraq is over. That was enough to get him re-elected. But how does it look today? al Qaeda is on the path to death, the war in Iraq is over, neither is true. And it's a disaster for our country. GUTIERREZ: We shouldn't have been there in the first place. I voted against the incursion in Iraq. We said then -- they said, and Bill knows this, we were going to be welcomed as liberators. We weren't. They said that it was going to be paid for, it wasn't paid for. The fact is, that we should have never have been there. This is a centuries-old fight between Sunnis and Shia. And even President Bush didn't -- couldn't even tell you the difference between the two and yet we had a military -- we shouldn't have been there. We shouldn't have sent our American men and women there in the first place. KARL: Very quick, yes or no question, does the president have the authorization should he decide to go forward? GUTIERREZ: I believe that the vote in 2002 which I voted against, but I will respect my minority -- I believe that that is still standing. BRAZILE: ...to bomb a sectarian civil war? GUTIERREZ: Who are we going to bomb? KARL: On that note, thanks everyone. KARL: Our Sunday Spotlight is next. KARL: Now, our Sunday Spotlight. 40 years ago this summer, President Nixon resigned, a crisis sparked by a foiled burglary, five men caught trying to bug the Democratic Party offices in the Watergate. Journalist Elizabeth Drew chronicled it all in her classic book Washington Journal. And now she's revealing new insights like Richard Nixon's secret plan for career rehab. George spoke with her this week. GEORGE STEPHANOPOULOS, ABC NEWS ANCHOR: You had the conviction was going to lead to massive consequences? ELIZABETH DREW, JOURNALIST: I just smelled that we might well be changing vice presidents and presidents within a year. Now, this was a crazy thought in many ways. It was -- it was nutty almost. But I just -- it was just my instinct. 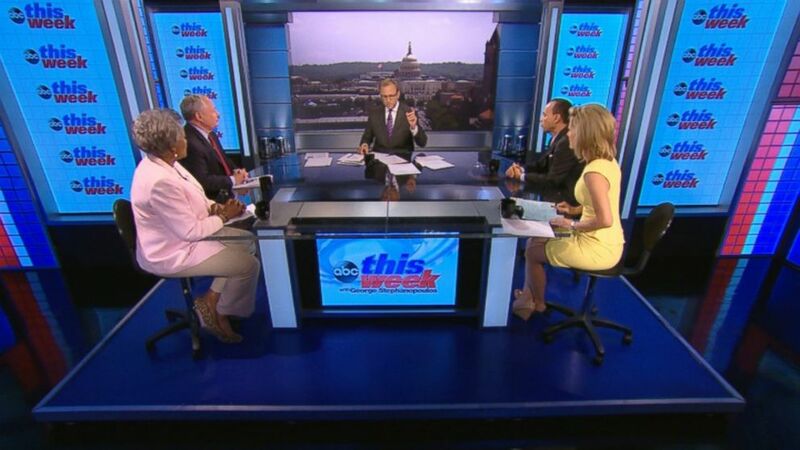 STEPHANOPOULOS: Is there a moment that crystallizes it? DREW: I think the moment when we had the Saturday night massacre. ANNOUNCER: From ABC News in Washington. UNIDENTIFIED MALE: Mr. Richardson, of course, is one of the central figures in the political and legal earthquake that rocked this city and this country last Saturday night. DREW: When the president ordered a series of attorneys general to fire Archibald Cox, the special prosecutor, for insisting that the president turn over tapes of his conversations in the Oval Office as the Supreme Court had ordered. We were getting these AP reports, bulletins, Richardson declined to fire Cox and has been fired. Ruckshaus (ph), he's been fired. The FBI has moved in on the prosecutor's offices and sealed them off. We were in a banana republic. It was very scary. It really shook people. That's when the word impeachment started to get into the air. Now it's thrown around so loosely it makes me crazy. STEPHANOPOULOS: Even after that historic vote. UNIDENTIFIED MALE: The ayes appear to have it. RICHARD NIXON, 37TH PRESIDENT OF THE UNITED STATES: I shall resign the presidency effective at noon tomorrow. STEPHANOPOULOS: Nixon plotted a comeback. In the book's new afterward, Drew details Operation Wizard. DREW: He decided, they're not going to keep me down. I'm going to show them. And I'm going to be a respectable person again. I want to be a guru. And so, he drew up a plan with his aides. Of course, everything has to have a code name, so this was code named Wizard. STEPHANOPOULOS: Did Nixon actually believed he might be appointed to some position under Ronald Reagan? DREW: He was a bit I try to stay away from psychobabble in here, but let us say he had some delusions. So, he went to China, because that was the place of his greatest glory, and he started making pronouncements as if he were president. And the other thing he would do is, he would come back and write a report, a secret report for the president and leak it to the press so that it got in the papers. Nixon was never boring. I miss him, you know. He was a very interesting man. STEPHANOPOULOS: And what is the most important thing you think people can learn looking back at those events over 18 months 40 years ago? DREW: You have to be very, very careful and very, very observant and with any luck, focused on the right questions, not the harum scarum, oh, he tied his shoe wrong, and so impeachment. This is serious stuff. And we have to hold the leaders accountable, but in a responsible way. KARL: Back after this from our ABC stations. KARL: More now on the crisis in Iraq. We're joined once again by General Peter Chiarelli and Martha Raddatz in Baghdad. Martha, I want to start with you, you of course are on your 23rd trip to Iraq. You were there for virtually every phase of that war. You were there as American troops left Iraq. What is your sense, did you ever envision something like this happening? RADDATZ: I think it was always a danger, Jon. All of us had great hope. I loved talking to the soldiers on that way out in that convoy, I think we were together for about 45 hours, driving out into Kuwait. And all of them said they had great hope. But all of them said that very hesitantly. I think when I walk around these streets, I see people who lost their legs. We passed a store today, it was a store full of wheelchairs out in the street. You know, Iraqi people have suffered so much, too. I was talking to a couple of 21-year-olds, thinking they were 9 years old when they the war started. They had the war most of their lives and there was some hope. But now, probably launched back into war, if not in Baghdad, certainly in other parts of the country. KARL: And General Chiarelli, you spent two years of your life in Iraq. And you saw nearly 700 men and women under your command who lost their lives. What can you say to those families now as they see al Qaeda on the move in Iraq, Iraq falling into crisis? CHIARELLI: I don't really know what you say to those families. This has got to be so difficult for them. It's difficult for the almost 4,500 survivors who have had lost loved ones in Iraq, it's difficult for all of the wounded. It's difficult for all of those folks who spent much longer than I did, much longer than two years -- four, five, six tours over there, and put their lives on hold, to see this happening is extremely difficult for all of us. KARL: I mean, does it mean it was all for nothing? CHIARELLI: Well, it really seems to be that way today. Hopefully, things will get better. But I fear that -- you know, we just celebrated the 70th anniversary of D-Day and those great Americans, not only after the war, but on this anniversary, were able to go back and see what their sacrifice and the sacrifices that they left behind were able to accomplish. I fear we have a generation of warriors that will not have that opportunity to ever go back to Iraq and really see what their sacrifices were able to provide for the Iraqi people, at least that's how it seems today. KARL: Martha, what are you hearing from the troops that you spent time with? I know some of them have been reaching out to you. What are they saying? RADDATZ: They're really terribly, terribly upset, Jon. I'm going to steal the words of one soldier because kind of the same words I would say, "it kills my heart." KARL: Well, Martha Raddatz, General Peter Chiarelli thank you for joining us. We now honor our fellow Americans who serve and sacrifice. This week the Pentagon released the names of six soldiers killed in Afghanistan. That's all for today. Thanks for sharing part of your Sunday with us. Check out World News with David Muir tonight. And to all of the dads out there, especially my father, happy Father's Day.